US Ouakam, from one of the suburbs surrounding the Senegalese capital Dakar, was the surprise champions of the Ligue 1 2010-2011. Recently, I found some interesting articles in Senegalese newspapers, describing some of the key players behind their success. * Petit midfielder Barthelemy Mané was a revelation last season. Mané is 171 centimeters and 65 kilos, somewhat unusual in a very physical league with several towering central midfielders. In the interview I’ve read, Mané explains that he worked hard with his physique before the season, making him able to battle hard and shield the ball despite his lack of size. Mané is described as a 24-year old playmaker and a wonderful counter-attack player. Mané is known for using his speed to bring the ball forward quickly, providing clinical passes to the front-men. Mané dictates the speed in the center of the field, making him the engine room of the team. I’ve read that some experts call him the “Iniesta of US Ouakam” or “Maestro”. The coach of US Ouakam has described Mané as “an expectional player with a great touch and wonderful skills”. Mané was apparently the player with most assists during the Ligue 1 2010-2011. Mané was signed from CSS Richard-Toll before the Ligue 1 2010-2011. Apparently, he is a product of the succesful academy Yeggo Foot Pro. * If Barthelemy Mané is the “Iniesta” of US Ouakam, then Ngagne Diallo is the “Xavi” of the team. Diallo is a hard-working box-to-box midfielder, often launching the attacks. Apparently, Diallo’s left-foot is one of the most dangerous in the league. * Several experts in Senegal will claim that Mamadou Sylla (born 22.02.1985) was the best central defender in the Ligue 1 2010-2011 last season. Sylla is a big, athletic, aggressive player who is surprisingly good with the ball in his feet. Sylla’s consistency was impressive, being pretty much ever-present last season, forming a rock-solid defensive pair with Jean Francois Diokh. Sylla has the ability to be at the right place at the right time, making decisive tackles when needed the most. Sylla was signed from Renaissance Sportive de Yoff before the Ligue 1 2010-2011. The picture is of Sylla and is taken from rsyoff.skyrock.com. * Other players that have been praised in local media before the new season is youthful left-back Pape Modou Ndiaye and of course, star player El Hadji Baye Oumar Niasse (born 18.04.1990). Apparently, Niasse was often found on the right-side of the attack last season, using his dribbling skills with great effect. 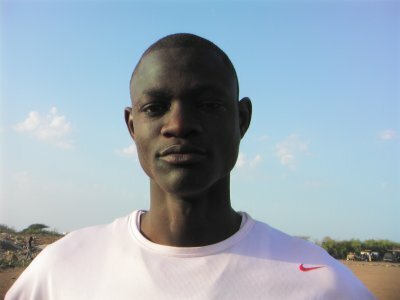 Yesterday, Niasse made a terrific start to the season, scoring a hat-trick when US Ouakam won 3-1 against Guédiawaye FC. It’s extremely rarely someone scores a hat-trick in Senegalese football. Niasse is arguably one of the most interesting prospect in the league these days.